Our man from Assisi: Road to priesthood brings him to Phila. Mark Cavara, 30, who will be ordained to the priesthood by Archbishop Charles Chaput for the Archdiocese of Philadelphia on May 21 at the Cathedral Basilica of SS. Peter and Paul, really wanted to be a football player when he was a kid, and if that didn’t work out, then maybe a coach or anything else associated with the game. Of course, God had other plans. He was West Chester born and raised. His parents, Kenneth and Noreen Cavara, had seven kids – six boys and one girl, and he was number five. He went through grade school at St. Agnes starting with kindergarten, followed by Bishop Shanahan High School. There would be a dramatic change in the family in 1997. Other role models and father figures were his coaches who helped keep him on the right track, encouraging him to make wise decisions. Also there were the priests of the parish, all good men. He especially remembers Msgr. Laurence Kelly, the pastor of St. Agnes, to whom he made his first confession. “All of the priests were devout guys; I was an altar server and watched what they did,” he said. Clearly they were excellent role models because St. Agnes has three men ordained in recent years and three in St. Charles Borromeo Seminary at this time, including Mark and his older brother Kenneth, who is completing his Pre-Theology year. 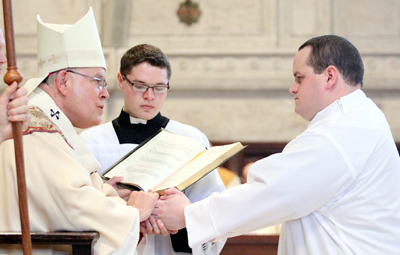 Archbishop Charles Chaput ordains Mark Cavara a deacon last year at St. Charles Borromeo Seminary. The archbishop will ordain Rev. Mr. Cavara a priest on May 21. Definitely, if all parishes had the same track record for priestly vocations as St. Agnes, the Archdiocese of Philadelphia would not have a priest shortage. Another priest who influenced him during his formative high school years was Father Peter DiMaria, who taught him as a freshman and as a senior. After graduating from Shanahan, he enrolled at Albright College in Reading to study journalism, but also to continue that first love, football. By that time he was a defensive tackle although he’d played different positions in his school years. He was still a freshman at Albright when he started to rethink his vocation, and slowly realized his calling to the priesthood. 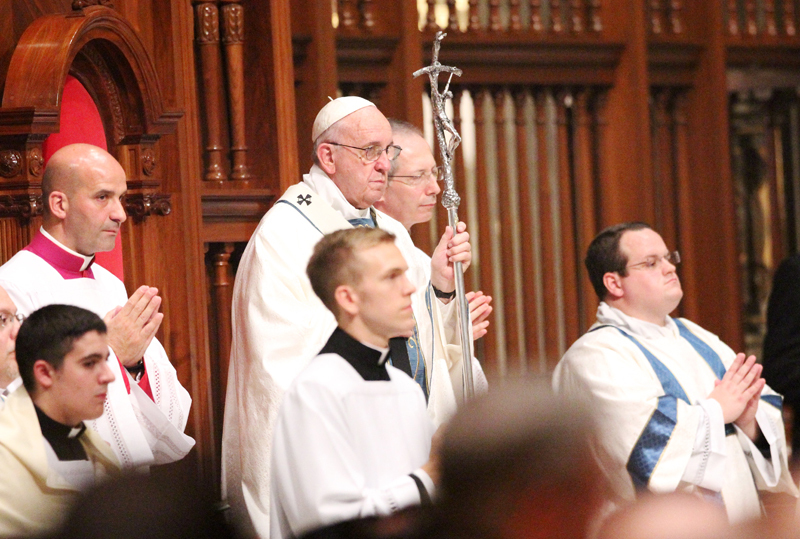 The priesthood is also a ministry for others, but on a different level, a sacramental level. He came to realize this with greater clarity and after just that one year at Albright, he left and applied to St. Charles. It has been a nine-year journey of continued discernment about to come to fruition. St. Charles doesn’t have a football team, but that’s OK, there was flag football at least. Also, “I like to ski,” he said. 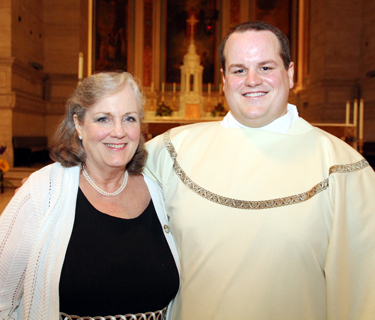 This year, as a transitional deacon he has served at St. Robert Bellarmine Parish in Warrington, where he has become part of the parish life by baptizing, preaching on weekends and helping in the school — in short, many of the things a young parish priest is expected to do, and that has cemented him in his vision of the priesthood. “Father James Beisel, who is the pastor of St. Robert, has been tremendous,” Mark said. At this point Mark is looking forward to ordination and maybe service in a parish, but will follow “whatever God has planned for me,” he said. 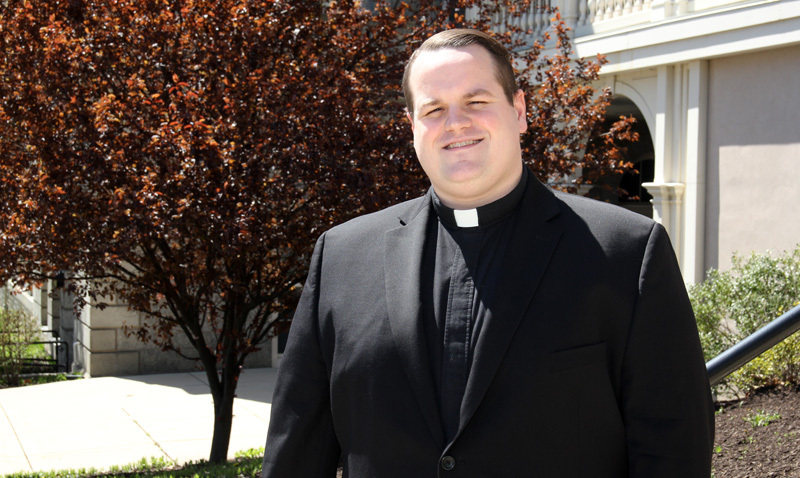 After ordination, Father Mark Cavara will celebrate his first Mass Sunday, May 22 at St. Agnes Church, West Chester. Father Peter DiMaria will be the homilist.